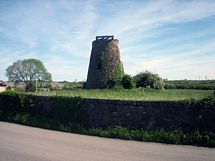 Full Description: SOLD - Derelict windmill with full planning permission for conversion to 3 bedroomed dwelling with observation deck. Extensive views of Snowdonia. Mains electricity, drainage and water. The property is located in an ixtensive plot in the village of Gaerwen in Anglesey one mile from the A55 motorway. Plans for renovation can be viewed with the property on request. This listing has been viewed 13406 times.